Burrito bowls are no doubt becoming a popular dish in the food industry and I thought I’d put my Primal touch on one. 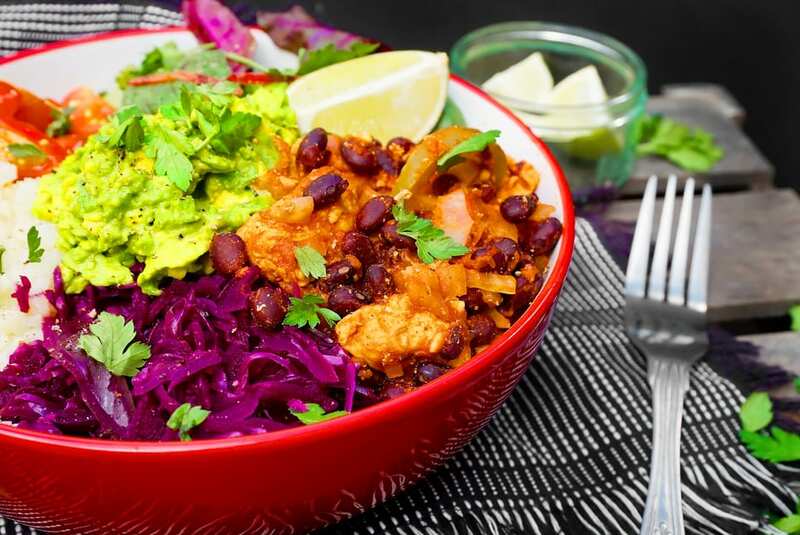 This smokey pork Mexican burrito bowl is packed with the most delicious flavours and it works wonders against the burrito salad. It really makes a perfect summer dish for these warmer evenings. The idea of burrito bowl is that it’s an emptied burrito. So basically no tortilla! Takeaway burrito bowls are packed with CARBs and bad fats however, I’ve simply ditched these by using cauliflower rice and organic lean cut pork. When it comes to eating organically, I strongly suggest that you try to do so when and where possible. I’m particularly strict about this after researching the facts. A book I would seriously suggest reading is Felicity Lawerence’s, ‘Eat your heart out’. Felicity goes behind the scenes of milk production, cattle and pig farming and much more. When I read the book myself, it concerned me so much about the produce we were consuming as a family that I told my wife, under no circumstances, was she ever to buy non-organic food again. It may sound a little drastic but the industry is worse than we think! Think about it, the caveman ate organically so really, so should we. We were not designed as humans to consume meat, poultry or dairy produce full of antibiotics and other dangerous toxins. The food in our fridge should be organic or outlawed. In America, more than 75% of all antibiotics sold are consumed not by humans, but by factory-grown animals that make their way into the American diet. It not just antibiotics, some cows are on hormones and steroids too. Add all of this to the morally cramped conditions of the factory that they live in and we start to realise that factory meat has virtually nothing in common to the meat our Primal ancestors once hunter. So please, when you can, eat organically! We are what our food eats. This recipe isn’t complicated at all. All it requires are a few ingredients, two essential spices – cumin seeds and smoked paprika – and roughly 40 minutes of your time. The best part about this dish is the smokey sauce that the pork cooks in. It’s absolutely delicious and the flavour really compliments the rest of the salad. Pair your bowl with a fresh dollop of homemade guacamole (that only requires 3 ingredients) and you’ve got yourself a flavoursome Primal dish that’s perfect for the whole family. PS, a top tip of mine: Meal prep this in advance and have it as pre-made lunches/dinners. That way, the pork can really marinate in it’s sauce and you’re left with a much more intense and smokey flavour. 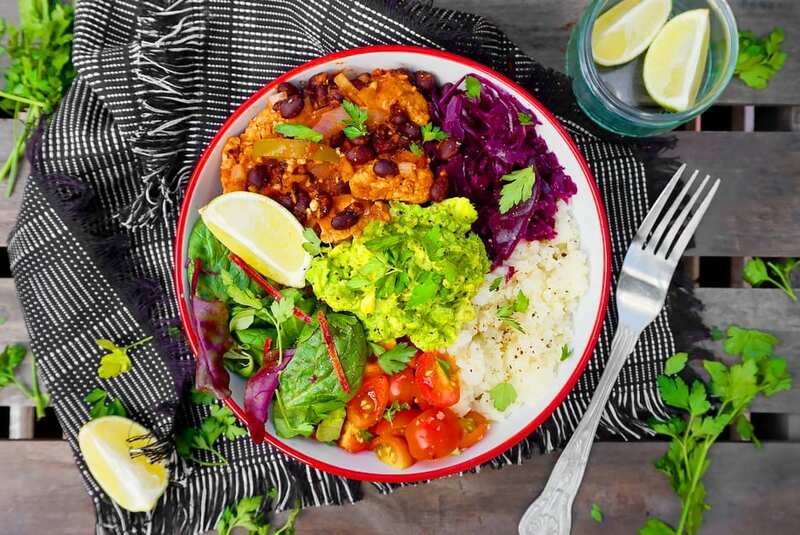 A delicious Primal Smokey Pork Mexican Burrito Bowl that's colourful, flavoursome and packed with nutrients and spice! Begin by heating a large pan with oil. Add the pork to the pan and cook on medium heat until brown on all sides. Add the cumin seeds, smoked paprika, salt, pepper, garlic, onion, red chilly and green pepper to the pan and cook for a few more minutes. Add the chopped tomatoes, apple cider vinegar and drained black beans and mix everything together. Bring to the boil and then simmer for half an hour. Half way through the 30 minutes, add the tomato puree, stir and leave to simmer again. While your pork is cooking prepare your burrito bowl. 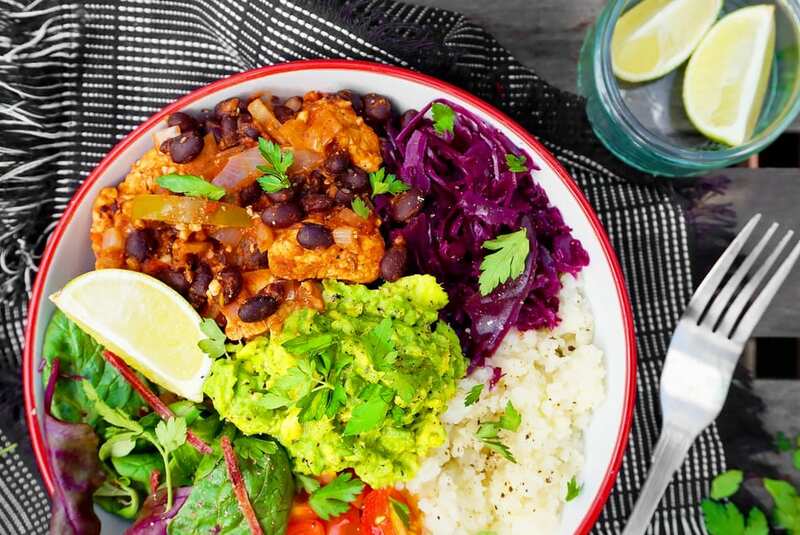 Evenly split the burrito bowl ingredients and add the cauliflower rice, cabbage, mixed salad and spinach and chopped tomatoes to sections of each bowl. Leave space for the pork. E.g, 3 cups of spinach would be 1 cup per bowl. Prepare the guacamole by adding a tbsp of lemon and pepper to the mashed avocado and mixing together. Set aside. Once the pork has cooked completely and you have a thick sauce texture, add a portion to each bowl. Top the bowls with a tbsp of guacamole, a wedge of lime and sprinkle with parsley and more pepper (if you wish). Serve up and enjoy!